its a huge honor to be a member of the greatest clan on Warlight. and the top team in the 3v3 ladder is made up of our members. Also a member on the 1st place on the grammar-ladder. wait. theres a grammer ladder? I am sorry, but isn't master Jz, PanagiotisTheGreekFreak, Master of the Dead, Sephiroth, and Timinator apex belong to the Masters clan? You guys are the After_Dark clan. Unless, the After_Dark clan members have taken 3rd and 9th on 1v1 ladder and 1st on 3v3 ladder? look at our clan logos you dummy. then look at the clan logos of the players in those ranks on the ladder. stop being so dumb. ii hate to admit it, but for once a member of the MARIO clan is correct. Turtles are really crappy, mind letting me tryout for your cool kids clan? Seretrina, but why did you say logos? There is only one logo, I thought...? But any clan can have the same logo as Masters, so that does not make sense. 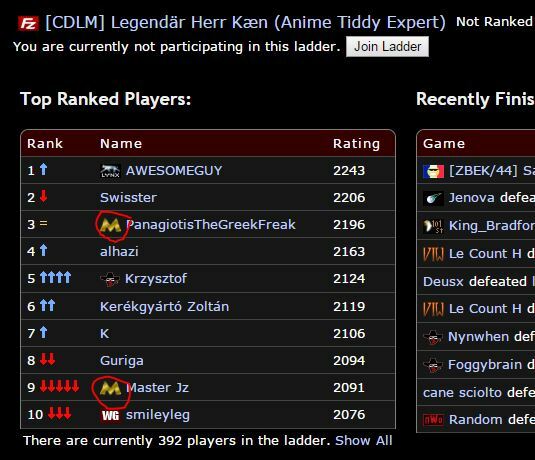 @ [CDLM] Legendär Herr Kæn (Anime Tiddy Expert) what is a wunderbear? Or is that just your incompetence showing? "Turtles are really crappy, mind letting me tryout for your cool kids clan?" @Buns157 what is your experience with Nintendo ? @Seretina Why isn't this in Clans forum ? I've concluded that "Wonderbear" is cognitively dissonant.